Remove tobacco and cannabis odors permanently. Period. 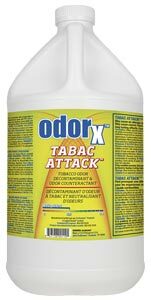 Specifically formulated to neutralize the odors associated with cigarette, tobacco and cannabis smoke, Tabac-Attack works at the molecular level to neutralize and permanently deodorize materials affected by tobacco odors. Tabac-Attack can be used on both hard or soft surfaces. When sticky tobacco residues accumulate, the resulting film on interior building surfaces continually release malodors. Heavy smoking over a long period of time causes stubborn and severe smoke odors. This proven system is the key to successful removal of tobacco and weed smoke odours. This video will remind you that smoking and growing Cannabis in Canada is a big thing and we are best to be prepared for it before our competition. Use water-based Tabac-Attack as an additive in upholstery, carpet cleaning and hard surface cleaning solutions. Apply Tabac-Attack with carpet cleaning equipment or sprayers. You can also use Tabac-Attack to launder affected fabrics. 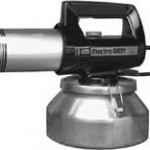 Be sure to check out the Unsmoke Electro-Gen Thermal Fogger for deodorizing. An effective odor counteractant machine.